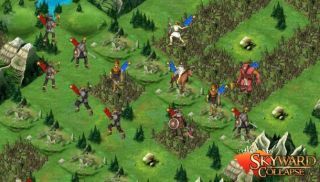 Previous details on Skyward Collapse, the turn-based god game from AI War developer Arcen, had suggested a mostly peacekeeping role for your deity. Not so, according to this first trailer. Your job is to keep both the island's factions alive, seemingly by escalating the conflict just enough that neither side can gain the other hand. A sort of mutually assured non-destruction. Whatever the fine details, the concept is a welcome twist on the god game model. Your floating hand can create, but not control, the island's Greek and Norse-influenced gods and creatures, and must then persuade them to carry out your orders. You can find more details on Arcen's teaser post , which also reveals the imminent Steam release date as May 23rd.